O poder que envolve o Location Intelligence! 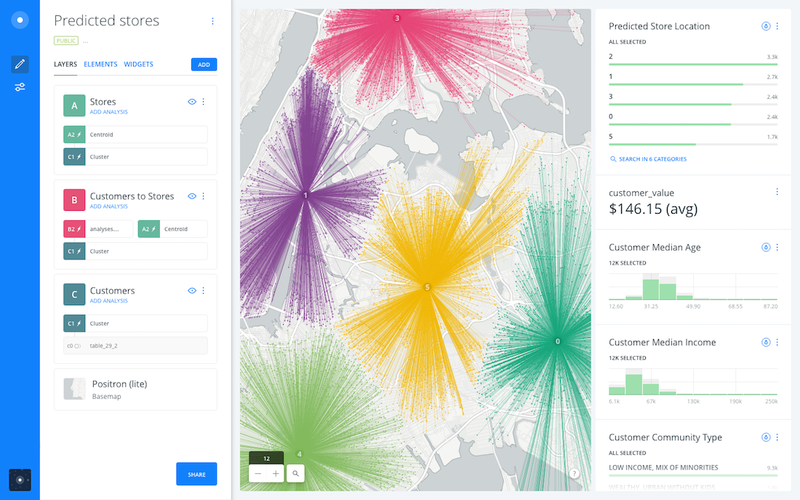 A one-stop shop of geospatial tools, services, and APIs for discovering and predicting the key insights from your location data, CARTO Engine empowers your organization with scalable analysis and enrichment solutions you can fully embed on your web and mobile apps. CARTO Engine allows you to embed CARTO's rich features, maps, and geocoding directly into other apps. CARTO Engine is a scalable solution for advanced predictive and spatial analytics that handles up to hundreds of millions of records. CARTO Engine empowers you to perform GIS, data analysis, and data visualization operations by providing you with a set of tools and APIs. With multiple APIs to choose from, you’ll have the necessary supplies to help you analyze, predict, and make inferences from your data. CARTO Engine is not only an app, service, or set of APIs, but is an embeddable platform that scales to manage millions of data points. 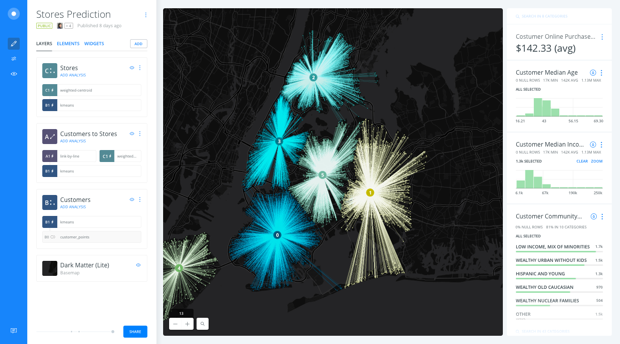 Connect your visualizations and customize, access, or query raw data with CARTO.js. From custom SQL to custom styles, all on the fly. Use the SQL API for data management or connect and delete your data with the Import API. Basemaps, geocoding, and routing—add location to your applications using our Data Services API. Access our data layers catalog and add context to your message based on actual metrics. Connect and enrich with the Data Observatory. Create dashboards and modify widgets that supplement your data analysis and visualizations with Deep-insights.js. Provide advanced location analytics in an scalable way for your applications. Use our Analysis API to leverage the real power of your data. 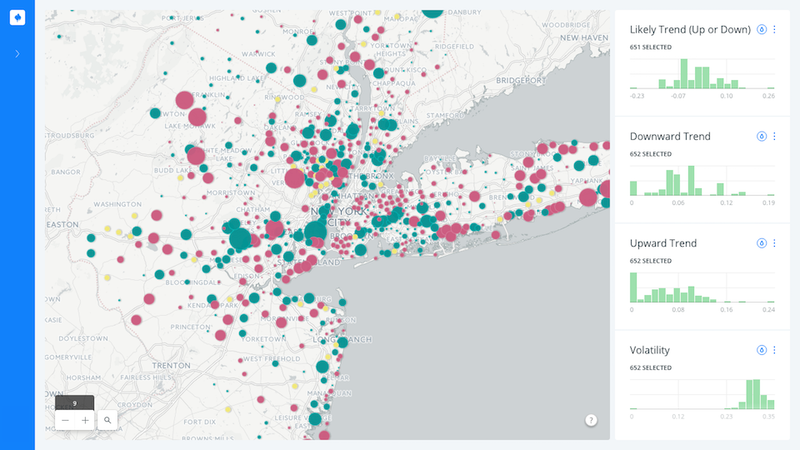 Real estate companies like JLL use CARTO to identify where business and property owners should expand, set up, and relocate by deriving data insights from various metrics. Leverage CARTO Engine's versatility and multiple APIs to optimize efficiency through customizable dashboards that update in real time. 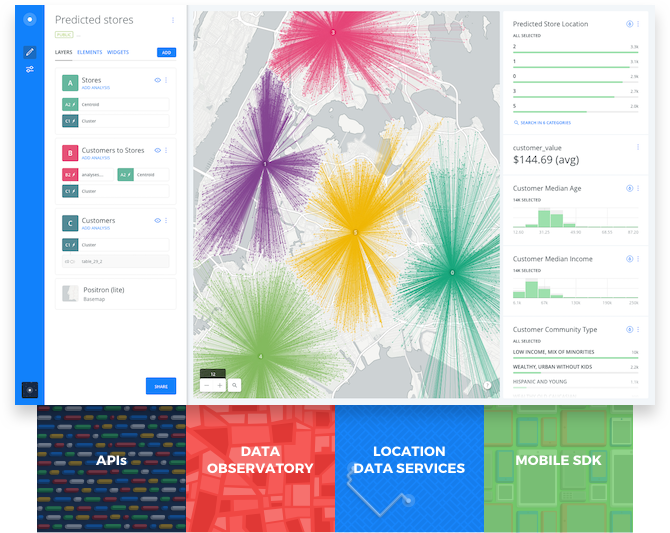 With the best terms and pricing, explore exceptional data, technology, and cartography. Use inside CARTO or as a stand-alone service that you can OEM and integrate into your applications. CARTO’s location data services are a one-size fits all solution that offers various services as APIs and SDKs to enable instant integration across devices. Global turn-by-turn directions for driving, biking, and walking. Added-value services like Demographics and Segmentation APIs. City governments can mitigate risks to ensure safer, better, and smarter cities. Using CARTO APIs, harness open data, layers, augments, and analysis for deeper insights to assist in risk management, track conflict, and insurance related decisions. Gain better understanding of the patterns and trends in your world’s data with the Data Observatory. Outsmart competitors with real business intelligence based on measurements of populations, jobs, commerce, and many other interesting location dimensions. The Data Observatory is a business ready, state-of-the-art data service that is packed with high-value location measures and boundary layers, that is equipped for augmentation, blending, and export. The Data Observatory enables you to use local and regional population measurements, plus dynamic calculations of potential customers based on direct input. Observe how demographics affect real estate value and commercial enterprises through an intuitive experience and fast drag-and-drop analysis. Develop custom applications with maps on any mobile platform—Android, iOS, and Windows mobile devices, with our cross-platform enterprise-ready SDK used by more than 60M users. Enable interactive geospatial visualizations and applications that deliver substantial value and meaningful insights. 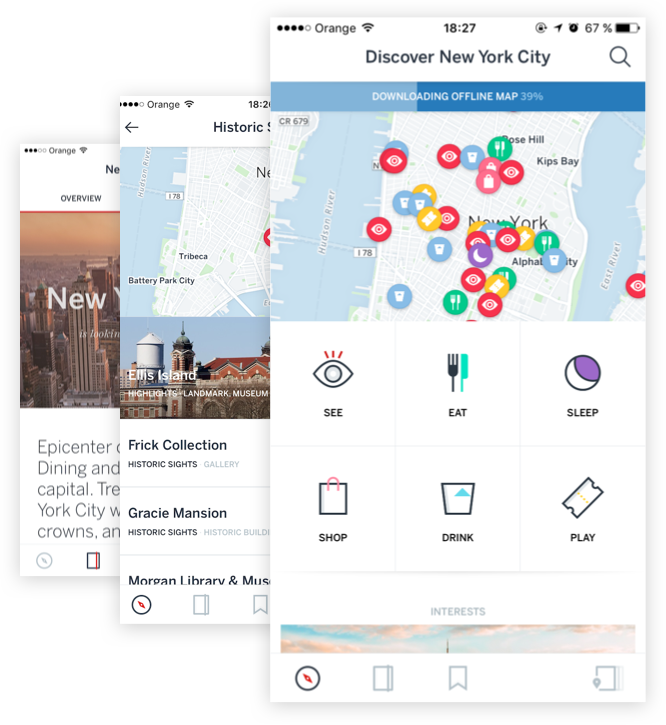 Build apps that take your brand from the page to the web with offline maps, essential infographics, and filters. Navigate any place with offline maps that allow you to find the perfect activity on the spot with powerful filtering. Get to the heart of your destination without missing a beat.